Bernhard Eisel says Mark Cavendish remains his best friend. But next year, he and the Manxster will square off in opposing jerseys. Cavendish’s high-profile move to Omega Pharma-Quick Step last month put Eisel on the spot. While Cavendish grated at Sky last season, Eisel found himself feeling right at home — so much so that the popular Austrian signed a deal to stay with Sky through 2015. Staying with the British ProTeam meant saying goodbye to Cavendish. For Eisel, the choice wasn’t easy, but it was the right one for him. Eisel and Cavendish have been joined at the hip since 2007, with the Austrian acting as a pilot and mentor both in and out of the high-speed bunch sprints at High Road. Cavendish quickly developed into the world’s best sprinter and Eisel was the consistent shepherd at his side. Eisel was the only former High Road teammate to follow him to Sky at the end of last season, but while Cavendish chafed at Sky, Eisel found he thrived in the team’s professionalism, organization and new ways of thinking. For Cavendish, it was a question of having the support he wants and needs for the bunch sprints. With Sky clearly backing Tour de France champion Bradley Wiggins and Chris Froome going forward, the Manxman’s honeymoon at the British team was short-lived. His move to Omega Pharma reunites Cav’ with former High Road teammates Tony Martin, Bert Grabsch and the Velits twins. But Eisel will not be there. For Eisel, Cavendish’s unhappiness was in sharp contrast to his positive sensations at Sky. And Cav’s insistence on leaving the team forced Eisel to choose between his friendship with Cavendish and his own professional and personal interests. Eisel, who will turn 32 in February, said after riding for High Road and experiencing the innovations that team brought to the game, he wasn’t expecting much at Sky, especially considering it was a relatively new team. But he quickly realized that the Brits were bringing something unique to the table. For Eisel, the choice between following Cavendish to Omega Pharma or staying with Sky came down to looking beyond his racing career. Although there is nothing specific, Eisel hinted he might have a future with the team when he eventually retires. He said he spoke extensively with Sky boss Dave Brailsford before making his decision to stick with him rather than follow Cavendish out the door. Eisel said things will change dramatically at Sky, both for him and the squad, without Cavendish as a sure bet in the sprints. The team has a few other fast riders, such as Ben Swift and Edvald Boasson Hagen, but Eisel admits that none of them are quite up to Cavendish’s level. “I am not afraid to race against Cavendish, but everyone knows that in normal conditions, Cavendish will win most sprints,” he said. “I don’t want to go up to the guys and say, ‘Okay, now you have to beat Cav’.’ It’s not easy to beat him in a one-on-one sprint. Despite Cavendish’s departure, Eisel said, his role is not likely to change that much. This season at the Tour, Eisel was already serving as a veteran road captain in addition to helping guide Cavendish in the sprints. He expects more responsibility in the classics (he won Ghent-Wevelgem in 2010 and was seventh in the 2011 Paris-Roubaix) and vows to be part of the team’s Tour future. 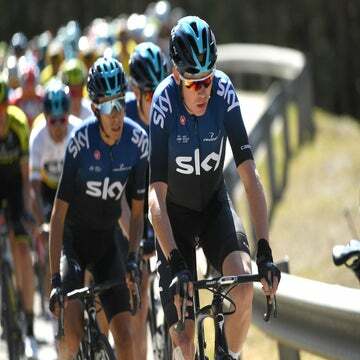 Sky will hold its first team camp in early December on Mallorca, when riders and staff will get together following the autumn break to plan and organize the coming season. That Cavendish will not be there is just part of the life of a professional bike racer; nothing personal. “We will make our own races,” said Eisel. “Now we are racing on separate teams, but if he’s in trouble one day in the gruppetto, I will still help him.